Celebrate does not sell directly to the public at large. All of our products are sold through a network of promotional products distributors. For that reason, you will not find our contact information on this website. If you would like to purchase our products, please contact one of our many local or nationwide distributors. You can find a distributor in the yellow pages, or via web search under “promotional products” or “ad specialties”. 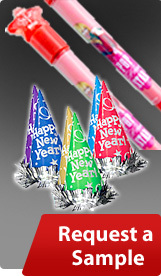 If you need further assistance or would like us to recommend a distributor, please e-mail us at info@celebrateline.com.